This beautiful three light chandelier features a classic design with metalwork finished in brushed nickel and beautiful white glass shades. The Commercial Electric 3-Light 60W Brushed Nickel Chandelier with Matte White Glass Shades will add syle and elegance to any room. The brushed nickel finish easily blends with any home decor. Perfect for a breakfast nook, kitchen or even an entryway. 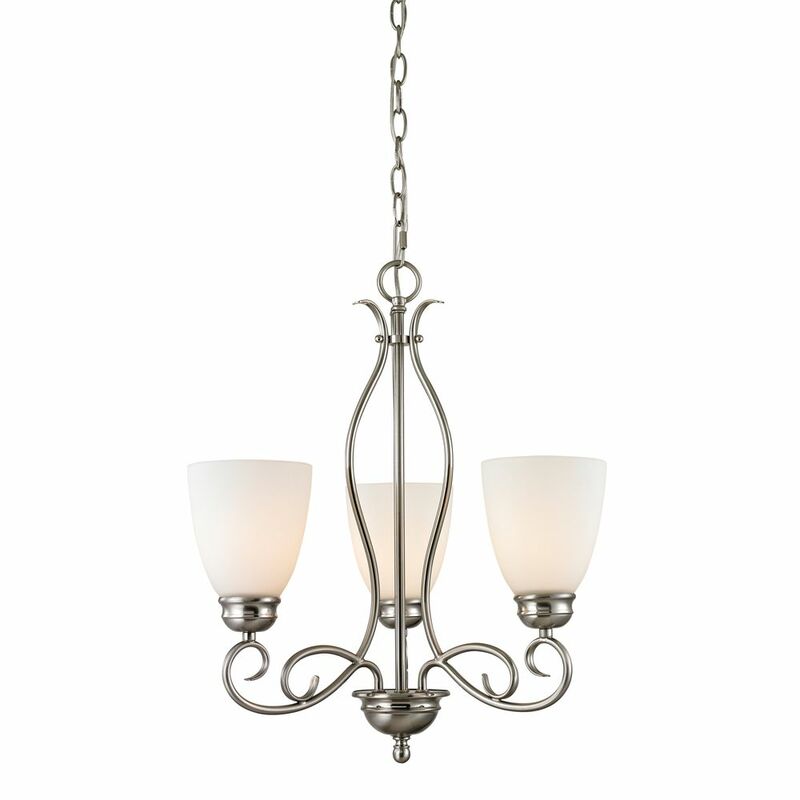 This breathtaking 3 Light Chandelier with Satin Nickel Finish is a beautiful piece from our Elton Collection. With its sophisticated beauty and stunning details, it is sure to add the perfect touch to your dicor. Gleeful simplicity defines the Joy Collection. Refreshing and fashionable, arcing forms of metal and glass are enhanced by a classic finish. Coordinating fixtures from this collection let you decorate an entire home with confidence and style. 3 Light Chandelier In Brushed Nickel This beautiful three light chandelier features a classic design with metalwork finished in brushed nickel and beautiful white glass shades.